the oilfields were flowing hard, large brown plumes entering the ocean. 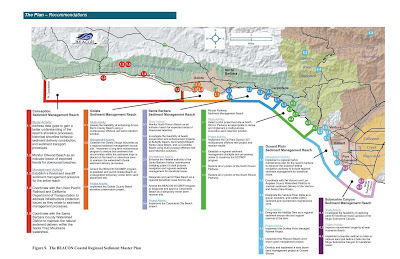 the work crew on the road said "I wouldn't go out there if I were you"
BEACON has just released the most comprehensive overview of the Santa Barbara/Ventura County coast to date. 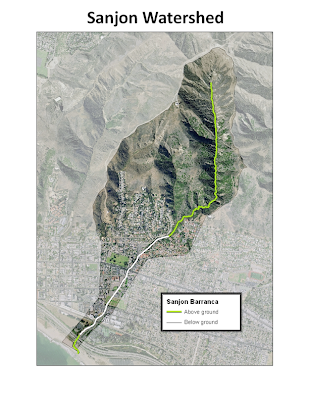 The Beach Erosion Authority for Clean Oceans and Nourishment (BEACON) is a California Joint Powers agency established in 1992 to address coastal erosion, beach nourishment and clean oceans within the Central California Coast from Point Conception to Point Mugu. 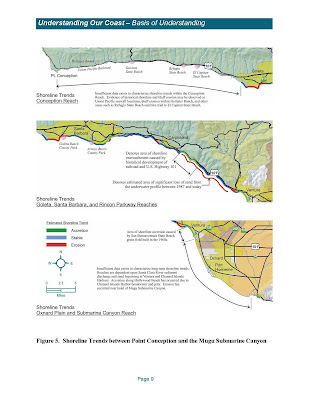 This graphic illustrates shoreline trends. The study defines a sediment budget for the region, outlines sources and sinks of beach sand, and proposes management strategies. Investigate the feasibility of beach preservation and enhancement projects at Arroyo Burro County Beach, Butterfly Beach, Summerland Beach, Santa Claus Beach, and La Conchita Beach using multi-purpose offshore reef sand retention solutions. 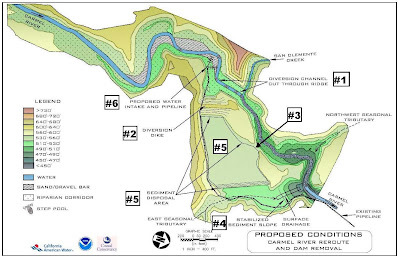 Designate the Ventura River Delta as a gravel, boulders, and cobble (GBC) sediment and nourishment maintenance zone. 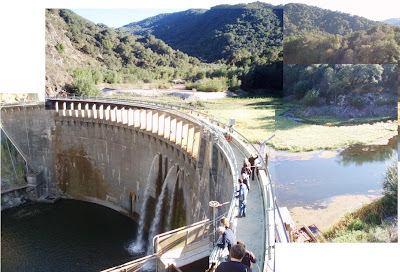 Designate the Matilija Dam as a regional sediment source site and support removal of the dam. Implement the Surfers Point Managed Retreat Project. Implement the Pierpont Beach wind blown sand management project. The study also includes an economic analysis which makes the case for widening beaches. The study is available on the BEACON website, and comments are being accepted. In preparation for the next Matilija Dam Design Oversight Group (DOG) meeting on December 4th, we have been out looking at the slurry disposal sites. The issue is summarized in notes from the last DOG meeting on October 2nd. In our comment letter, we pointed out that one of the proposed disposal areas (MODA) is a very popular public access point, of which there are few within the watershed. We are also concerned that disposal in this area would be permanent, rather than located in an area where the river would be allowed to wash the fine sediments downstream during future floods. 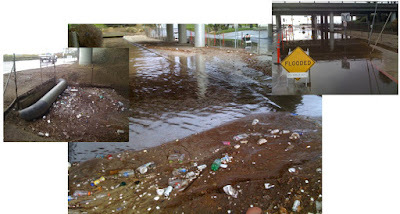 MODA (Meiners Oaks Disposal Area) is shown in this image. 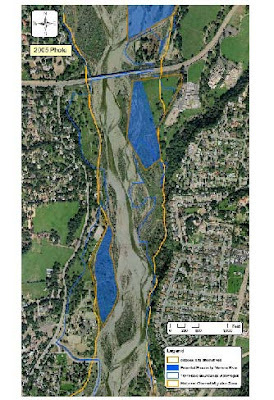 The blue shading is the area which the river could potentially erode in the future during a 100-yr flood. 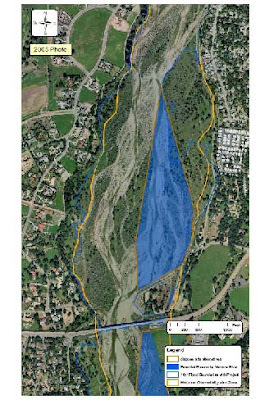 Note that the planned levee upstream of the site would effectively prevent the river from accessing this portion of the floodplain. This photo is taken from the bluff near the trailhead, and shows the 70 acre floodplain area. The entire 2.1 million cubic yards of sediment could be deposited here at an average height of 35 feet. The upstream Baldwin Rd site (BRDA1) is within the floodplain. Because these are active river channels there is less old growth vegetation (oaks and sycamores) and more riparian floodplain vegetation. The analysis shows that this site would erode in the future (blue shading). This photo shows the view looking upstream from the levee that protects a historic 'burn dump' landfill in the floodplain. The second Baldwin Rd site (BRDA2) is County property that used to be the jail honor farm. The site includes active channel and floodplain terrace, much of which was used for grazing. The river would also erode much of this site in the future. This view is looking upstream from the westernmost corner of BRDA2, with the active channel visible to the right. Discussion of slurry disposal will be continued at the December 4th DOG meeting. Over a dozen organizations had information tables for the over 400 runners and walkers. Event proceeds went to the Friends of the Santa Clara River. 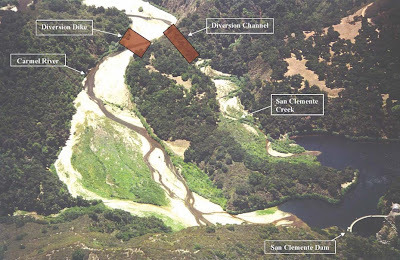 The EPA has listed the Ventura River as an "impaired water body" for a variety of problems, including trash, bacteria, water diversion and pumping, and pesticides (DDT/PCBs). The Clean Water Act requires that government take action to solve the problems to ensure the river is fishable and swimable. The regulatory mechanism for this is "Total Maximum Daily Load," or TMDL. For the past year, the State Water Quality Control Board has been working to develop a TMDL for Algae in the Ventura River. See also the County of Ventura website. The primary concern is that algae growth may be fueled by excess nutrients (nitrate and phosphate), which in turn creates large daily swings in dissolved oxygen (DO.) If DO drops below 4 mg/l, aquatic life can become stressed and fish kills may occur. (This is also called 'eutrophication') The presence of endangered species makes this issue even more critical. Stream Team volunteer data has been used along with scientific analysis at UCSB to monitor and study algae over the past year. This graph is actual data from 24 hours of sampling on the Ventura River. 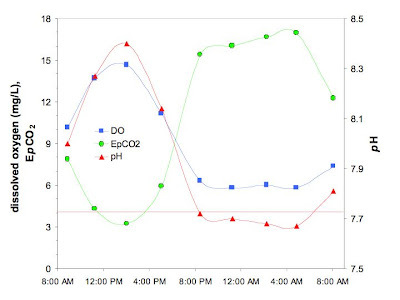 It illustrates how photosynthesizing algae releases O2 during daylight hours, generating peak DO measurements in the early afternoon. However, overnight DO levels drop dramatically, with a minimum in the pre-dawn hours. Traditionally, nutrients are seen as the driver for excess algae growth. Nutrients may originate from broad land uses such as agriculture, livestock, septic tanks, treated wastewater, as well as atmospheric deposition. It turns out that algae is widespread throughout the Ventura River watershed, and is highly variable with season and annual climate (wet or dry year.) Algae is also dependent on river flows, water temperature, sedimentation, and a host of other variables. Because of these complex relationships, algae may be seen as a symptom of ecological stress, rather than a problem in itself. This raises a complex question when it comes to regulating algae as a pollutant: the TMDL process was originally developed to control point-source pollution. It is clear that in this watershed with shallow, over-drafted aquifers and strong surface water/groundwater interactions, a meaningful algae TMDL will require a watershed approach that takes into account ecosystem processes. 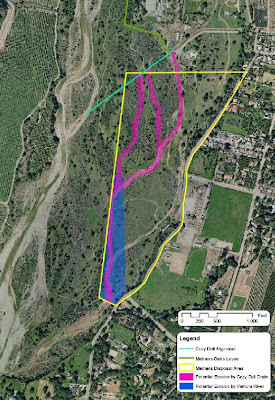 Integrated watershed management will be necessary to address excess algae in the Ventura River. 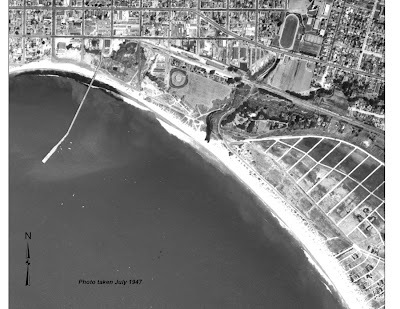 Los Angeles developer Frank Meline subdivided the Pierpont Bay area into small lots during the late 1920s, putting in roads, building a pleasure pier and paving Shore Drive along the beach. The lots came with design guidelines for English-style homes, on lanes with English sounding names. The Stock Market Crash of 1929 changed the fate of Pierpont beach forever; lots that had been offered for $2900 per lot suddenly were worth $10. Then, eight years later, two storms – eleven months apart – in January and December 1936 wiped out the pier, bathhouse, boardwalk and Shore Drive. These storms effectively stopped all development in Pierpont until the mid-50s. Between 1925 and 1936, few houses had been built, and after the storm some were moved to higher ground. Only a handful of pre-1936 houses remain in Pierpont. Today, the area is a eclectic mix of mid-century beach shacks and recent 2.5-story custom homes of every style imaginable, and Shore Drive is a memory beneath the dunes at the end of the lanes.